Mexico, 1861, Second Issue, ½r black on buff, Queretaro, complete sheet of 60, full o.g., with complete unreduced selvage all around, some folds mostly between stamp but one affecting 6th horizontal row, few natural preprinting paper wrinkles, F.-V.F., a great rarity with only three sheets recorded, another sheet was auctioned by us in 2016 for $6,000 hammer. Scott No. 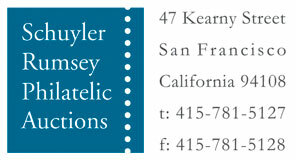 6 Estimate $3,000 - 4,000. A REMARKABLE COMPLETE SHEET OF THE 1861 ½R ISSUE FROM QUERETARO. Mexico, 1861, Second Issue, 2r black on pink, Mexico, vertical pre-printing paper fold, tied by mute grid handstamp on December 10, 1863 folded letter to Madrid, Spain endorsed "Via de Inglaterra", carried to Bordeaux with blue Georges Rafford oval forwarding handstamp, boxed "Apres le Depart" handstamp as letter arrived too late for the British steamer Tampico, reverse with transit and receiving cds's, letter with interesting content regarding the mails and the war…Por motivo de las muy críticas circunstancias por que está atravesando esta República, el gobierno ha suspendido toda clase de comunicaciones con los frentes ocupados por los francesas, y sólo a fuerza de instancias y de ruegos, se ha podido conseguir el que hoy salga un extraordinario para Veracruz conduciendo solamente correspondencia para Europa, with further notation… Los franceses se han movido rumbo a Puebla, cuya población defiende el ejército mejicano. Manuel supo tarde de la salida de este correo, Very Fine, this being one of the first correspondences allowed by the French to be forwarded addressed to a foreign destination. Scott No. 8 Estimate $500 - 750. Veracruz was taken peacefully by the French on December 12th. Mexico, 1861, Second Issue, 2r black on pink, Morelia, tied by socked-on-the-nose strike of circular rimless Sahuayo handstamp (Schatzkes 989) on 1862 folded letter to Ciudad Guzman, Very Fine and choice, a stunning item. Scott No. 8 Estimate $200 - 300. 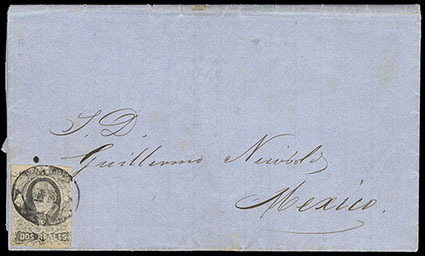 Mexico, 1861, Second Issue, 2r black on pink, without district overprint, Acapulco Provisional, on April 1868 cover datelined from Mazatlán and addressed to Mexico City, forwarded to Acapulco with blue oval cachet handstamp on reverse, entered the mails with stamp canceled by Acapulco circular handstamp (Schatzkes 4), Very Fine; with 1991 & 2008 M.E.P.S.I. certificates. Scott No. 8c Estimate $4,000 - 6,000. 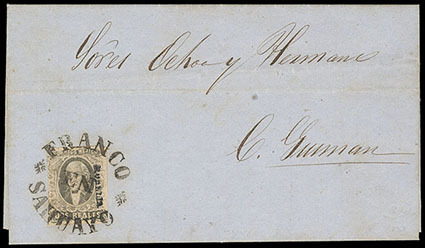 THE UNIQUE EXAMPLE OF THE 1868 2R ACAPULCO PROVISIONAL ON COVER. 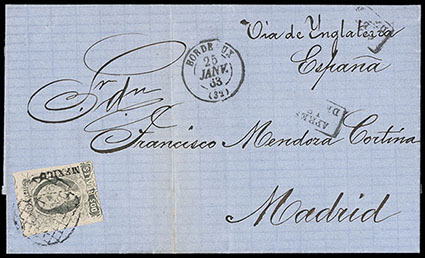 This cover was sent from Mazatlan to Mexico via Acapulco, where this stamp was added and canceled. Since these stamps were demonetized in 1864, this cover is a provisional usage. No others from Acapulco have been recorded. 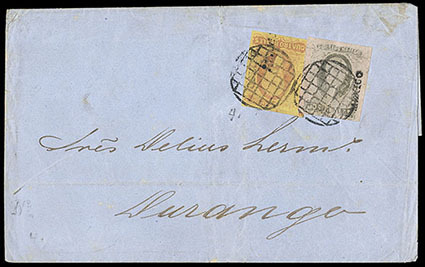 Mexico, 1861, Second Issue, 4r dull rose on yellow, Mexico, in combination with 1861, Second Issue, 2r black on pink, Mexico on 1862 folded letter sheet to Durango, tied by mute grid handstamps, Very Fine. Scott No. 10+8 Estimate $400 - 600.